The sea environment can be quite lonely and dull. However, having a marine stereo system with high-quality marine speakers can drown the loneliness and make your experience in the sea more enjoyable. Thus, marine speakers are a must have for anyone who enjoys spending time out in the sea for water sports, boat riding or even fishing. After all, who doesn’t enjoy listening to music while doing what you love? However, there’re many misconceptions surrounding these speakers. Most people shy away from investing in marine speakers due to the myths that exist about them. Read on through this article for the most common myths about marine speakers and distinguish the myths from facts. Most marine vessel owners believe that they must install huge speakers in their boats to get the best sound. They assume that only the hugest speakers are loud and only huge speakers can deliver high-quality sound. However, this myth is not factual. The quality and loudness of sound you get from a boat speaker does not depend on the size of the speaker. You can actually have a 3.5 inch speaker that outperforms a 6.5 inch speaker. The quality and loudness of sound you get from a speaker depends on its power and quality of materials making the speaker. Not all speakers perform the same. Thus, you should invest in a speaker based on its quality and power but not just the size. After all, there’s no need to buy a huge speaker that will perform poorly. You should only consider size depending on the space you have on your boat for installing the speaker. Thus, size alone does not determine the performance of a speaker. Many boat owners shy away from investing in these speakers by believing that they’re extremely expensive. You won’t be surprised to hear a friend telling you that they would not install speakers in their boats because they are expensive. They will quote exorbitant prices that they’re not sure of by assuming that they aren’t affordable. However, this is far from the truth. It’s a myth that has no basis or facts. Marine speakers are actually very affordable. You’ll be surprised to know that there’re many types of boat speakers within your budget. No matter how tight your budget might be, you’ll surely find a great speaker for your boat. Thus, never shy away from installing speakers in your boat by assuming that you can’t afford them. Simply shop around and compare different options and you’ll find a high-quality and powerful speaker within your budget. One of the most common myths about marine speakers is the belief that it’s extremely difficult to install speakers in a marine vessel. When you ask a friend why they are yet to install speakers in their boat, they’re most likely to tell you that it’s extremely difficult to install them. Also, don’t be surprised to hear someone say that it’s impossible and impractical to install these speakers in a boat. However, this is not true. It’s very possible to install these speakers in any boat. Also, it’s quite easy to install speakers regardless of the type of your boat. If you are a DIY handy person, you’ll actually find it fun and easy to install the speakers on your own. It’s not a must to hire a professional boat speaker installer. You can easily find online guides on how to install boat speakers on your own. Thus, don’t be afraid to invest in speakers for your marine vessel since it’s easy to install them. Most people wonder whether it’s actually possible to listen to music or radio out in the seas. Obviously, the sea environment is full of noise wind, water waves and a roaring boat engine. Thus, most people assume that speakers are not clearly audible in the noisy sea environment. However, this is far from the truth. It’s very possible to hear sound from these speakers very clearly while riding boat safely. The best marine speakers are designed to be audible in the sea. They’re loud enough while still allowing you to hear all details in audio. Moreover, they’re designed to project sound in a way that listeners will hear the sound clearly without the sound being drowned in the noisy environment. Will marine speakers survive in the harsh sea environment? This is a common question that most boat owners ask. Many people assume that these speakers will wear out quickly. They believe that since the sea environment is full of humidity, harsh winds, hot sun, and salty water among other elements, speakers installed in a marine vessel will get damaged quickly. However, this is not true. These speakers are different from regular speakers. They’re specially designed to withstand the salty and humid sea environment. They’re made of tough components and are protected against damage from salty water. Actually, the best marine speakers are waterproof. They don’t allow water into the interior components and are not susceptible to corrosion or rust. Therefore, you can install them without worries of getting damaged in the harsh sea environment. Just ensure you invest in speakers designed for boats. You cannot use a car speaker in your boat and expect it to hold up well. As long as you’re investing in the right speaker for your boat, you’ll be assured of many years of service. 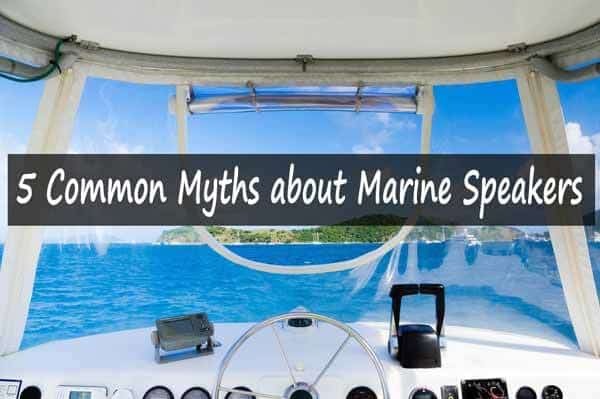 By learning the facts on these common myths about marine speakers, you’ll stay away from misconceptions and only rely on facts. If really you desire to enhance your experience out in the seas, go ahead and invest in high-quality speakers for your boat. In fact, it will be very fun to install the speakers on your own. With the right tools and some time, you’ll not have to hire anyone to do the installation for you. Moreover, these speakers are built with heavy-duty components to withstand the harsh marine environment, thus don’t worry about the myths that exist.